Sure, it's easy to buy a bag of pre-made trail mix at the grocery store, but it's a whole lot more fun to make it yourself because you can select exactly what goes into it. Sure, it's easy to buy a bag of pre-made trail mix at the grocery store, but it's a whole lot more fun to make it yourself because you can select exactly what goes into it. This means there's no need to eat around boring peanuts or those weird sesame sticks. You can enjoy all of your favorites in a customized trail mix! Added bonus: You'll always have a healthy snack on hand. Just be sure the majority of your ingredients aren't loaded with sugar and covered in salt. Aim for a ratio in your trail mix that is three parts healthy ingredients to one part fun stuff. Nuts (18-24 ounces): Whole nuts are the base of my trail mix. My personal favorites are almonds and pecans, but I switch up the varieties from time-to-time. If I'm feeling indecisive, I'll buy a big canister of mixed nuts and use them for the base of my trail mix. If you're watching your sodium intake, opt for unsalted nuts. Dried fruit (12 ounces): I typically divide my dried fruit into two categories: small (raisins, cranberries, cherries, blueberries, or chopped dates) and large (pineapple, apricots, apple rings, banana chips, or mango slices). 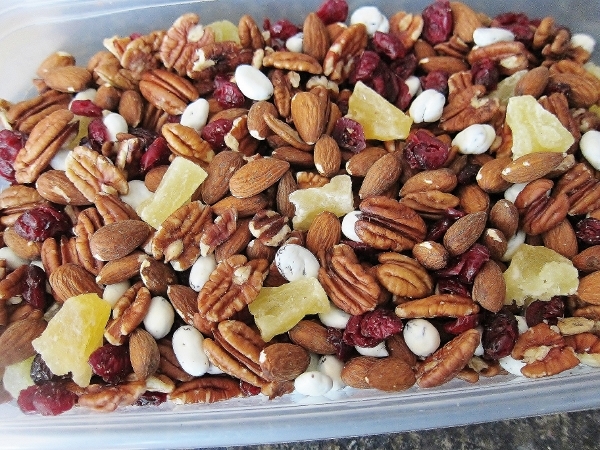 I love how dried fruit adds a chewy texture, subtle sweetness, and some vibrant color to my my trail mix. Seeds or other crunchy ingredient (6 ounces): I round out the various trail mix textures with some crunch! It's typically in the form of seeds (sunflower or pumpkin), but I will sometimes add in pine nuts, chia seeds, or dried coconut chips. Fun stuff (6 ounces): I saved the best for last! Even though the "fun stuff" makes up a small percentage of my trail mix, it's still the part I look forward to the most. Some of my favorites: dark chocolate chunks, M&Ms, yogurt-covered raisins, butterscotch chips, and shredded coconut.